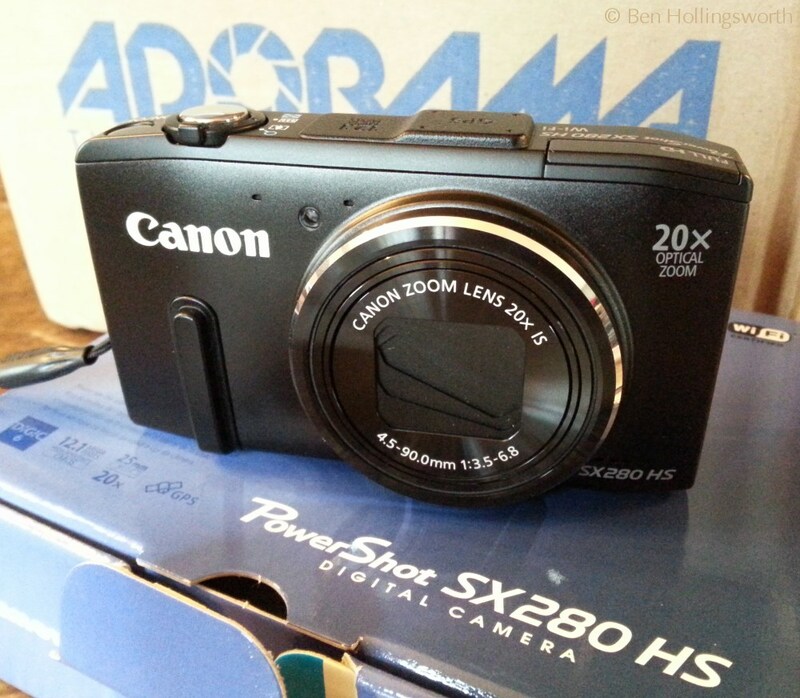 Nearly four months after dropping my old Canon SD870IS camera onto a hard gym floor and breaking the lens mechanism, I finally ordered a new point & shoot camera in the form of a Canon SX280 HS. The SX280 is slightly larger than the SD870, but is still very pocketable. The big win comes with quite a number of feature improvements that have worked their way into pocket cameras during the five years since the SD870 was made. Below, you'll find my initial thoughts after playing with the new toy for a little while. Upon unboxing it, the first thing I noticed was that the lanyard / wrist strap is just a simple loop. It no longer has an adjustable clasp that cinches the strap tight against your wrist, which is very handy when using the camera in dangerous environments like outside the window of a moving car. The SD870 had such a cinch, so I just moved its wrist strap over to the new SX280. The 20X zoom range (ranging from a full frame equivalent of 25-500mm) is wonderful. My daughter especially likes this, as it allows her to reach faraway objects that would previously have required her to use my DSLR and 300mm lens. Below, you can see the first two photos I shot with this camera, one at the widest angle and another at the narrowest angle. I was standing in the same spot for both photos. The high-speed movie mode rocks. I shot a few sample videos of my son on his new BMX bike as a test. I used the 640x480 / 120fps mode instead of the 320x240 / 240fps mode because I find 320x240 to be an unusably small size. In high-speed mode, there is a lag time of nearly one second from the time you hit the record button until the video actually starts recording. This is a little frustrating, but tolerable as long as you know about it and can plan ahead. When shooting in normal-speed 1080p / 30fps mode, there is no such lag time. The videos play back on the camera at 30fps, so a 120fps video runs in quarter time. This is great for analyzing form during bike jumps. It also makes the biker feel like he got some killer hang time! At first glance, I don't see any way to change the white balance or the exposure compensation during high-speed video recording. That's unfortunate, especially when most of my background is a cloudy, grey sky. Zooming and autofocus both work just fine while recording a normal-speed video. Zooming does not work when recording a high-speed video (not sure about autofocus). The built-in lens cover is a multiple-leaf design that is very easy to open manually simply by brushing the cover. The leaves also seem rather flimsy. I'm a little concerned that it might get damaged if the camera was sharing a pocket with anything else... like, say, a finger or a set of keys. The power on/off button takes effect almost instantly. It's recessed below the surface, and is right next to the elevated shutter/zoom button, so I have little fear of it getting pressed accidentally. All the same, I may glue a rubber o-ring to the body around the button to further protect it, just like I had to do with my old SD870. The SX280's power button is much larger than the SD870's was, which is nice. If you want to turn on the camera to view images rather than take photos, pressing the "play" button on the back will do so without extending the lens. This, too, works almost instantly. Here's a weird one. Sometimes when you're shooting a video, the orange "low battery" icon will start flashing on the LCD. If you turn the camera off & then on again, the icon will disappear, and the standard battery power icon will indicate a nearly full charge. If you simply ignore the low battery icon instead of turning off the camera, the camera will continue working for quite some time. Apparently, something is falsely triggering the low battery signal. 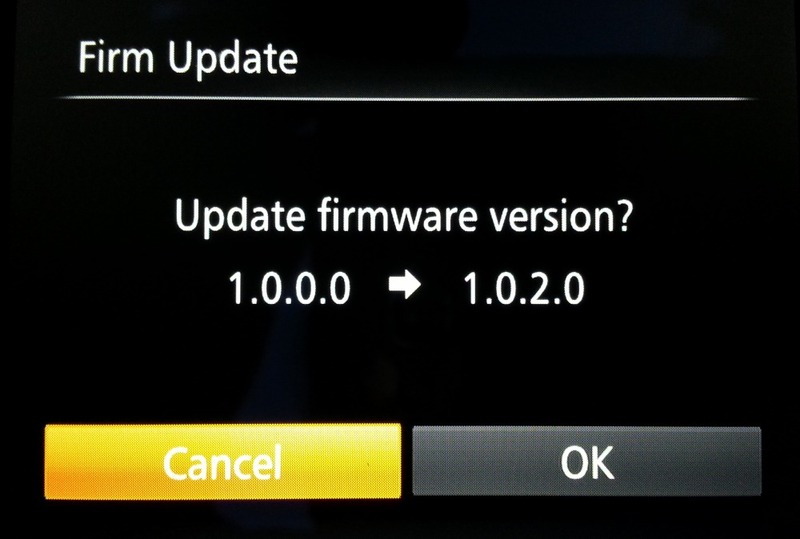 Canon released a new firmware (v1.0.2.0) on 6 June 2013 that addressed this issue. Download it here. I've heard people complain about the short battery life, and they're right. The difference is dramatic compared to our old SD870. 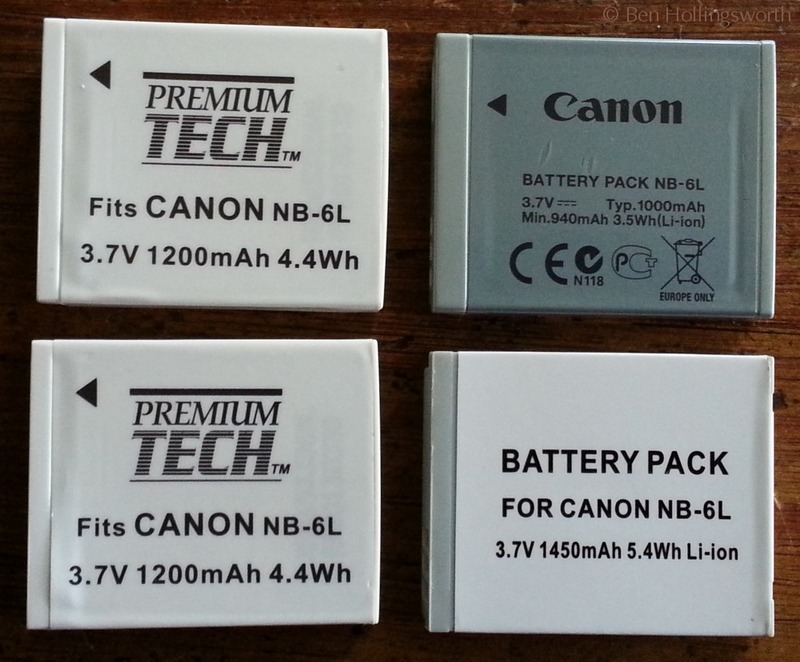 Make sure you have at least one spare battery just for general everyday use around the house. If you're heading out on a trip where you won't have easy access to an electrical outlet for your battery charger, then get at least two or three spare batteries. 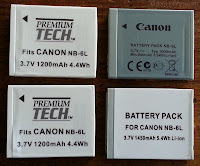 The Canon original battery has a 1000 mAh capacity. I ordered one additional 1450 mAh battery with my initial purchase. Not long afterward, I ordered another pair of batteries advertised as 1600 mAh, but received a pair of 1200 mAh batteries instead. I've yet to burn through all four before I could get to a charger. One thing I miss from my SD870 is the ability to erase images by date. The SD870 would show me a list of all dates on which photos were taken, and would allow me to check off which dates I wanted to delete. It was very handy, since it allowed me to keep the most recent month or so of photos on the memory card (for reference). The SX280 allows me to select a range of photos to delete, but it doesn't give me any information on the first & last photos as I'm selecting them. The SX280 has the capability to link with my smartphone for directly sharing images online. I set it up once, but the process is unintuitive enough that I've never used it. There are two features missing that I really would have liked to see: the ability to make panoramic and HDR images. Both of these are common on smartphones, and the lack of these features on this nicer camera is annoying. The image quality of the SX280 is pretty good--better than the SD870, I'm sure. However, when used for large prints or viewed at 100% resolution, it still can't hold a candle to a DSLR with a half decent lens. This is especially true in darker environments that require higher ISO settings. Nevertheless, the small size and long zoom range make this our preferred camera when we're heading out for simple outings. In short, I definitely recommend the Canon SX280 HS to anybody looking for a convenient point & shoot with good image quality. Just make sure you pick up a couple spare batteries to throw in your bag. If you've got any other questions or comments, please speak up in the comments below.